“Twenty two stops to the city, 22 stops…” Garland Jeffreys voice kicks in, joining the drum’s beat on “Coney Island Winter,” his new single from his forthcoming album The King of In Between, a lament and love letter to New York City. Brooklyn-born Jeffreys is a New York City storyteller who uses music to lay his story down. His introspective autobiographical songs use the city as a character. Listen to “New York Skyline,” “Ghost Writer,” or “Mystery Kids.” You cannot separate him from the city or the city from who he is. Even when New York is not mentioned by name, you sense it in the words and the characters of his songs. 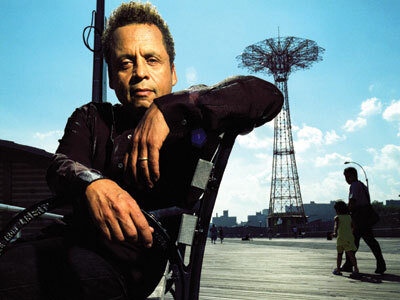 Garland Jeffreys pens love songs and laments for his beloved New York City. The Manhattan resident’s cultural background is black, white and Puerto Rican. He grew up (22 subway stops from the city) in Sheepshead Bay in a multi-ethnic neighborhood where his was the only family of color in his local Catholic church. This racial diversity underlines and at times punctuates his music. Over coffee last week in a First Avenue cafe, he told me, “Growing up in that multi-national neighborhood in a large and loving extended family was a blessing. It readied me for the world. I’ve always mixed well with people.” In the restaurant, I saw evidence of this when he warmly greeted the wait-staff with waves and a smile. Easy to see why he counts Bruce Springsteen and Lou Reed as close friends. Jeffreys is married to Claire Jeffreys, a writer and his business manager. Their daughter, Savannah, 14, pens her own music. Being there for his family is the central reason he’s been out of the musical limelight for several years. After a long period of retreating from the music business, he came to see performing as the most important facet of his musical identity, and little by little that led to a desire to get back to writing new material. Hearing Jeffreys’ stories, seeing the city through his eyes, visualizing his “Racial Repertoire,” gave me a desire to engage other cultures and consider the race issue from both sides. This readied me when I went to work for city government and comfortably adjusted to the cultural diversity there. In June 1992, I drove my brother, Rory, upstate to a rehab program. Not for the first time. He and I tried hard to become closer as brothers, but we couldn’t make it work. I loved Rory, but didn’t know him. At the same time, I was having personal problems and was about to change jobs. I came home to New York City miserable. The next day, I read that Jeffreys was giving a free concert at Summerstage in Central Park. I felt so low that I almost didn’t go. Jeffreys played for two hours. The cops were dancing by the third song. It was a gorgeous day and people whirling around sent the dust on the floor of the space into the air, where it stayed for the entire show. I wrote my first story when I was 49, eight years ago. The seed to write that story was planted in Central Park in 1992 at that show. Garland Jeffreys & the Coney Island Playboys headline the Highline Ballroom Saturday, April 30.